You’ll never guess what Richard Rohr said about Mennonites! How’s that for a click bait title? In March, I went to California to spend a few days with Rob Bell and Richard Rohr. Both are gifted authors and communicators, and it was truly a gift to see them riff together for sixteen hours without notes, and not only blow my mind, but blow each other’s. I took 34 pages of notes (which is more than I took in most of my university courses), and I could talk for hours about what they said, but what I did want to record here was the conversations I had with them. So, I was a bit of a groupie in awe of these two, and I was determined to take a picture of me with them. But I wanted to at least pretend to have a bit of substance to me, so I figured I’d ask them a question first, and then pose for the picture (I’m sure they’ve never seen that move before). Let’s start with Rob Bell. We were in line, getting Wachos (waffle nachos), and this is a paraphrased version of our conversation. And then I went and ate my Wachos on the beach while watching a dolphin swim by. My take home thoughts from that conversation: I don’t do it for them. Their toxicity is a symptom of their toxic faith. I do it for the people who want to find life in this movement called Christianity, but don’t want anything to do with THAT. 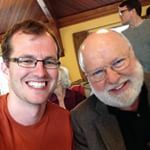 And then, during an afternoon break, I went and asked Richard Rohr a question. My take home thoughts from that conversation: I need to pray more. And dang it, did he ever feed my ego and make me proud to be a Mennonite, hence my need to pray more. Obviously, there was tons more in those few days, but those are the paraphrases of the conversations I had with Rob Bell and Richard Rohr. And if you haven’t read any of their books, be sure to stop by my office and I’ll hook you up.